Hello dear readers. 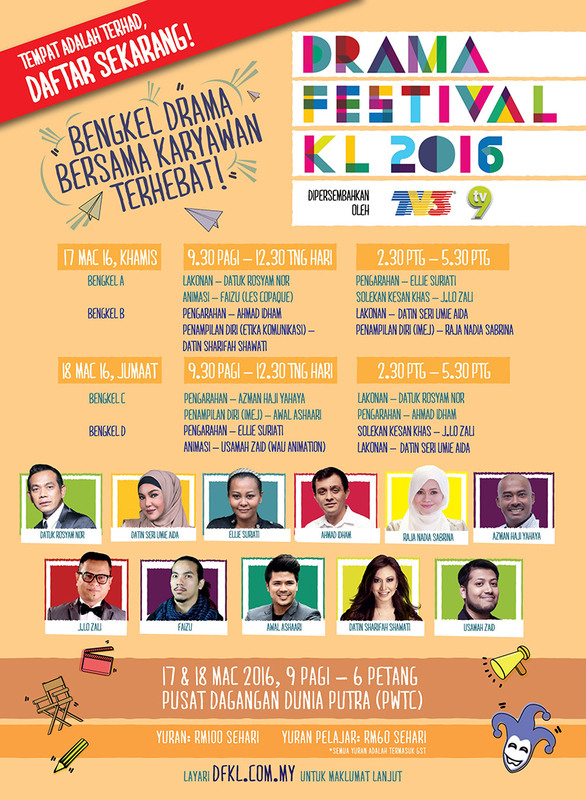 On the first Monday of 2016, I was invited to give a talk at the Drama Festival KL 2016 by TV3. I accepted the invitation right away and the talk is going to be next Thursday, 17th March 2016. Quite nervous to give a talk, but I thought it would be good to share based on my experience and hopefully it can benefit others too. I am giving a talk on the importance of being presentable and will be giving styling tips. Having said that, tomorrow I'll be leaving overseas to China and will only be back in KL on Thursday morning. I will pretty much go straight to give the talk that afternoon on the same day that I arrive from China. If God wills it. These past few weeks have been super hectic and even more so these past few days. Alhamdulillah, it's a good kind of busy. May Allah make it smooth, successful and easy. My session Insyallah is scheduled at 3.00pm Bengkel B, at Putra World Trade Centre. Do register as the seats are very limited. Just go to www.dfkl.com.my for more info! Hope to see you there!